With their bold and disruptive approach to building fibre networks, Frogfoot Networks began looking for a BSS/OSS solution to help them manage their rapidly growing network. 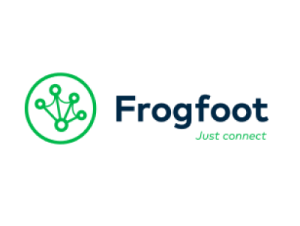 With business goals to increase their number of fibre links into the thousands, Frogfoot wanted a solution that, in addition to supporting their network roll-out, would enable both automation and the ability to innovate their service delivery processes. It was critical for Frogfoot Networks that their BSS solution allowed their customers to easily order new services, view the status of line installations and request services changes online. They wanted a solution that would provide their customers, suppliers and internal service delivery teams with real-time link delivery and status information. Frogfoot has selected Business Automation experts, SOLIDitech, to assist them on their journey. With SOLIDitech’s automated solution in place, Frogfoot will be able to manage their fibre network operations from feasibility studies to workflow driven documentation and 3rd party contractor management, to the installation of dark fibre and the provisioning and billing of fibre services. Automating each aspect of this end-to-end process provides Frogfoot with a solution that not only gives them operational visibility and efficiency, but significantly reduces the number of manual operations. Built on a central database, SOLIDitech’s Fibre Automation Platform allows Frogfoot to see exactly which phase of installation a project is in, and above all, that everything is on track. Frogfoot Networks is a licensed open access fibre network provider that is widely acknowledged for their technical excellence. Frogfoot intends to play a pivotal role in the growth of fibre to the business and home in South Africa. Frogfoot is well positioned to build and maintain fibre networks that will enable service providers to acquire their own fibre backbones on a shared network. Having operated fibre networks throughout South Africa for 15 years, Frogfoot understands the challenges of deploying and managing large fibre networks. Currently, the company has an extensive fibre footprint, with more than 6,000 buildings connected to its network and a fibre coverage area spanning more than 10,000 km2 in 5 regions. Fibre networks are at the heart of reliable, robust, high-performance telecommunications services; you need a company that has a sound grasp of telecoms engineering principles and how to implement them, looking after those networks.